LA ROQUE, MARGUERITE DE, related to Jean-François de La Rocque de Roberval; deported to an island in the St. Lawrence River. The date and place of her birth and death have never been ascertained. She was co-seigneuress of Pontpoint, of which Roberval owned a part. Her principal lands, however, for which she had pledged fealty and homage in 1536, were in Périgord and Languedoc. Her family relationship to Roberval was very close, according to Thevet. Among Roberval’s companions on his voyage to Canada were Marguerite and a young man, her lover, but the latter is not named either by the Queen of Navarre or by Thevet, both of whom recount this romantic adventure. Shocked by Marguerite’s conduct, Roberval set her down on an island called Île des Démons, in the St. Lawrence near the mouth of the Rivière Saint-Paul. According to Thevet, the young man joined her there. In the Queen of Navarre’s account, it was the young man who was put off the ship and Marguerite who went to share his fate. The servant-girl Damienne, “a native of Normandy,” accompanied them. Marguerite gave birth to a child, who died; the young man succumbed too, as did the servant-girl. Marguerite stayed on alone on the island, using her firearms against the wild animals; she managed to survive and was one day picked up by fishermen who took her away to France. There are considerable differences between the accounts given by the Queen of Navarre and by Thevet, but Thevet is much more precise. 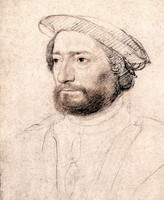 He indicates the family relationship between Roberval and Marguerite de La Roque, and provides certain details that are historically accurate, such as the separation of Jacques Cartier’s ships and those of Roberval, the presence on the ships of men and women intended for the colony, and the location of the Île des Démons. All this gives Thevet’s narrative an authenticity which both confirms and supplements the skilfully contrived little romance of the Queen of Navarre. Thevet states that he was told of this episode by the heroine herself, whom he met at Nontron in Périgord. The Queen of Navarre says that it was “Captain Roberval” who told her this story, from which she derived one of the tales of her Heptameron. Historians have conceded that the accounts of these two contemporaries of Roberval and Marguerite de la Roque are based on an actual happening. AN, Anciens hommages et aveux, 1536, pièce 820, Languedoc, 556, Foi et hommage de Demoiselle Marguerite de La Roque pour ses terres. BN, MS Fr. 15452–53 (“Le grand insulaire et pilotage d’André Thevet, Angoumoisin, cosmographe du Roy, dans lequel sont contenus plusieurs plants d’isles habitées et deshabitées et description d’icelles”; 15454, (“Relation de deux voyages faits par André Thevet aux Indes australes et occidentales).” Marguerite de Navarre, L’Heptameron des nouvelles (Paris, 1559). Thevet, Cosmographie universelle. Henry Harrisse, Notes pour servir à l’histoire, à la bibliographie et à la cartographie de la Nouvelle-France et des pays adjacents, 1545–1700 (Paris, 1872). Pierre Jourda, “Marguerite, reine de Navarre,” thèse pour le doctorat ès lettres, Université de Paris, 1930. Lanctot, Histoire du Canada, I, 104–5. Henri Malo, “L’Île des Démons, la reine de Navarre et Alcofribas,” Mercure de France, LXXXVI (1910), 639–45. Robert La Roque de Roquebrune, “Marguerite de La Roque et l’île de la Demoiselle au Canada,” NF, VI (1931), 131–42. R. La Roque de Roquebrune, “LA ROQUE, MARGUERITE DE,” in Dictionary of Canadian Biography, vol. 1, University of Toronto/Université Laval, 2003–, accessed April 21, 2019, http://www.biographi.ca/en/bio/la_roque_marguerite_de_1E.html.